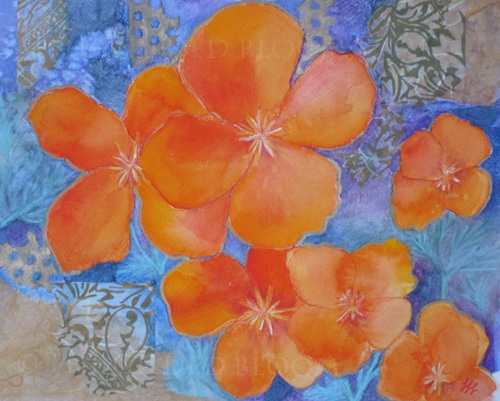 This mixed media painting captures the vivid color of orange poppies as they explode into bloom during the spring and summer months. Because these wildflowers seed themselves so easily they are usually grown in groups and form tangled bunches of brightness that seem to pop up everywhere. Here the orange is amplified by the surrounding blues and purples and the flower's light grey-green leaves mesh into the textural background. This piece is accented with iridescent beads, patterned papers and metallic gold line work.